Google has recently removed three useful options from the advanced search sidebar. 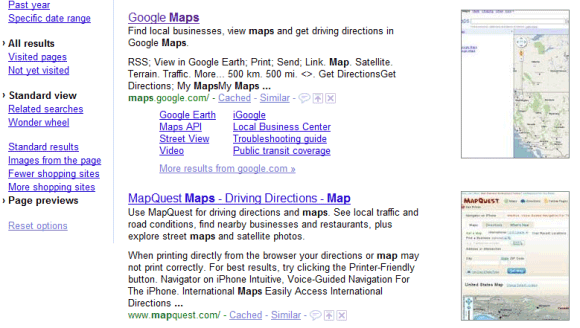 You can longer restrict the results to shopping-related pages or remove shopping sites from the results. Another option that has been removed is page previews, which displayed a longer snippet and a thumbnail for each search result. This feature has been replaced by Instant Preview, but you can no longer see all the thumbnails next to the search results. When Google launched the sidebar, back in May 2009, it was the first time when powerful features like restricting the results to recent pages didn't require to visit the advanced search page. "We think of the Search Options panel as a tool belt that gives you new ways to interact with Google Search, and we plan to fill it with more innovative and useful features in the future." 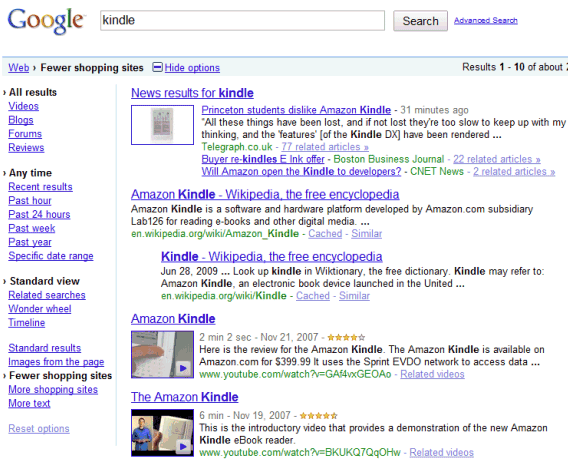 Shopping still shows up as a filter on my browser's Google SERP. This post is not about the Google Product Search link from the menu. Google removed two refinement options (more shopping sites/fewer shopping sites) that were really useful. I guess "Fewer shopping sites" gave more illegal download website results, hehe. Hmm, I'm beginning to dislike google more and more. The instant preview function does not offer any practical value to me, only clutter. I find it distracting and annoying. There is no way to disable it. Google has become really crapped up with content farms lately. "Fewer shopping sites" really helped clean things up. Not any more. With its usefulness dropping, Google is clearly searching for the right balance between signal and noise. Unfortunately for users, noise == money. instant preview is only enabled if you click on the magnifying glass icon, dont click it if you dont like instant preview, and once you click and enable it, clicking once again will disable it. What about "More text"? It seems to be gone, too. What's the third thing removed? I didn't care much about the thumbnails, but I really thought the more/less shopping was useful. "more shopping sites" was extremely useful when looking to buy something. Please can we have it back? Boooo .. same here, definitely like the "more shopping sites" option when shopping around for stuff. I was able to use more shopping sites + pages from canada button very successfully!! It is very difficult to search for INFORMATION about a product, when the vast majority of hits one always gets is retail websites. The "fewer / more shopping websites" filter was one of the most useful things I have seen on Google in years. Google is not run by idiots -- they probably know how useful this feature was, but they pulled the feature anyway. Companies will often make choices that benefit themselves at the expense of their user base... maybe Google is really that different. If another search system offers this feature along with some privacy, I will be using Google less and less. No good thing lasts forever! If I am looking for something to buy I don't want to see anything other than sites offering a product for sale, but if I am looking for info only, I absolutely abhor seeing all these hustlers online trying to lure me to their website to sell me something. For that reason, if ever a good search engine comes up that offers these features, I will immediately say Adios! to Google! Opposite of most of the posters here, I found the "fewer shopping sites" option to be the most useful. Now when I use Google to search for information, I'm back to sifting through tons of garbage shopping sites I have no interest in whatsoever. Right, if Google has a "Shopping" category like "Images" and "Videos", then shopping results could be restricted to that category and kept minimal on the default search page. That would enormously speed up searches for information rather than ways to empty your wallet.